A storm fueled by a band of moisture over the Pacific is bringing heavy rain into Southern California. Up to 4 inches of rain are expected, and another storm is on the way Thursday and Friday. 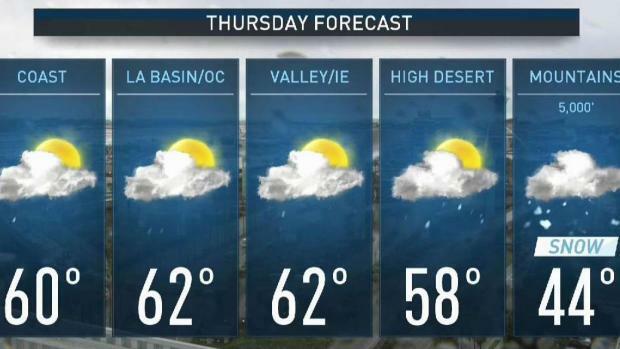 "This is going to be heavy moisture," said NBC4 forecaster Shanna Mendiola. "It will make for a wet commute for everybody some time today." A jack-knifed big rig closed lanes early Wednesday on the 101 Freeway near De Soto Avenue in Canoga Park. In Malibu, a three-vehicle crash happened behind an NBC4 reporter on live TV. A stretch of Pacific Coast Highway was closed in Huntington Beach due to flooding. At Los Angeles County beaches, a water use advisory cautioning people to avoid swimming, surfing and playing in ocean water around discharging storm drains, as well as creeks and rivers, was issued through Saturday morning. Bacteria, chemicals, debris, trash and other health hazards from city streets and mountain areas are likely to contaminate ocean waters after rainfall. The advisory will be in effect until 7 a.m. Saturay, but may be extended. The heaviest rain is expected to fall overnight and during the Wednesday morning commute, Mendiola said. The coast and valley areas could see as much as 2.5 inches of rain, while the foothills and mountains could see up to 4 inches. This winter's consistent storms have dropped more than 12.43 inches of rain in Los Angeles, above average but not a record. In 2005, Los Angeles received 23.53 inches of rain from January through April. In 2017, about 12.72 inches of rain were recorded in LA during that same period. Flash flood watches will be in place for Ventura and LA county burn scars Tuesday night through Wednesday morning. A Flash Flood Warning was isssued for parts of the Thomas Fire burn area in Ventura County until 10:30 p.m. on Tuesday night. Residents in or below the recently burned areas are urged to take the steps necessary to protect their property. People in the watch area should remain alert and follow directions of emergency preparedness officials. More rain is expected Wednesday and there's no end in sight to this pattern. Anthony Yanez has your First Alert forecast for Wednesday, March 6, 2019. "Mud flows and flash flooding are possible, particularly in recent burn areas," Mendiola said. The heaviest rainfall across Santa Barbara county is expected, impacting the Sherpa, Whittier and Thomas burn scars through around 7 a.m. Wednesday. 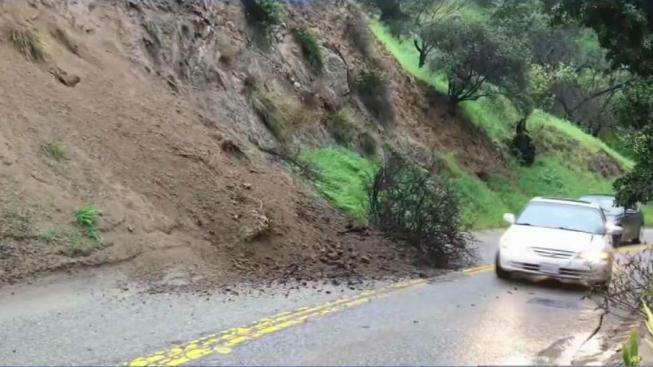 Across Ventura and Los Angeles counties, the heaviest rainfall is expected late Tuesday and Wednesday morning, impacting the Thomas, Hill, Woolsey, Stone, South, Creek and La Tuna burn scars. The storm, fueled by an atmospheric river, will be accompanied by winds up to 40 mph. An atmospheric river is a band of moisture in the sky over the Pacific. Storms can tap into that moisture, resulting in hours and, sometimes, days of steady rainfall in California. Snow levels will be relatively high, around 7,000 feet. 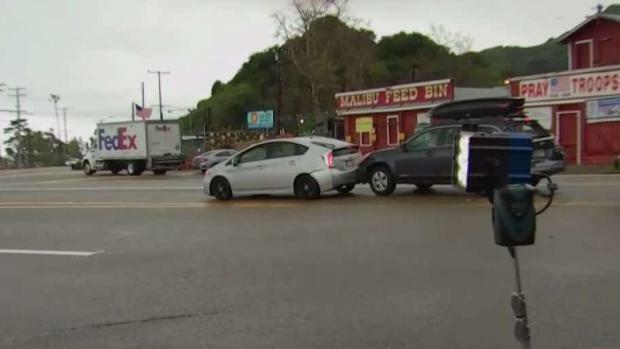 Three vehicles were involved in a chain reaction rear-ender during an NBC4 report about a March rainstorm in Malibu. Patrick Healy was reporting live from the bottom of Topanga Canyon at Pacific Coast Highway for the NBC4 News at 11 a.m. on Wednesday March 6, 2019 when he and viewers heard the impact off to the side. Patrick later learned from the drivers of the Prius and the Subaru that they were stopped for the light, and they believe the impact from behind pushed the Subaru into the Prius. The Subaru's occupants said the driver of the pickup told them he had applied the brakes, but was unable to stop in time. No one was injured.